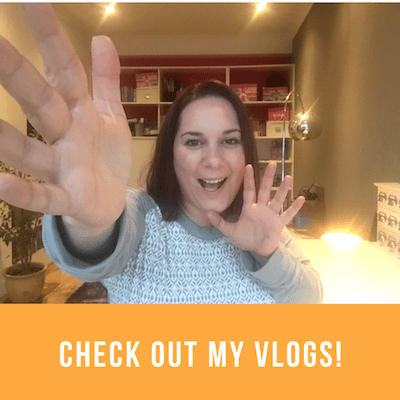 July is officially my favourite month of the year; not least because it’s my birthday month, but it usually means that the big family holiday is on the horizon – and the countdown is on! This year we’re off to Germany. We’ll be spending a few days at Europe’s second most popular theme park, Europa Park, followed by some time in the Black Forest, which is supposedly stunning. So why Germany? Well, we were really impressed with Hamburg when we went last year and people kept mentioning to us about how picturesque it is in the Black Forest. So we decided to bite the bullet and book something. Plus, Luis is going to be taking German as one of his GCSEs in the next couple of years, so he can get practising with the locals while he’s there! 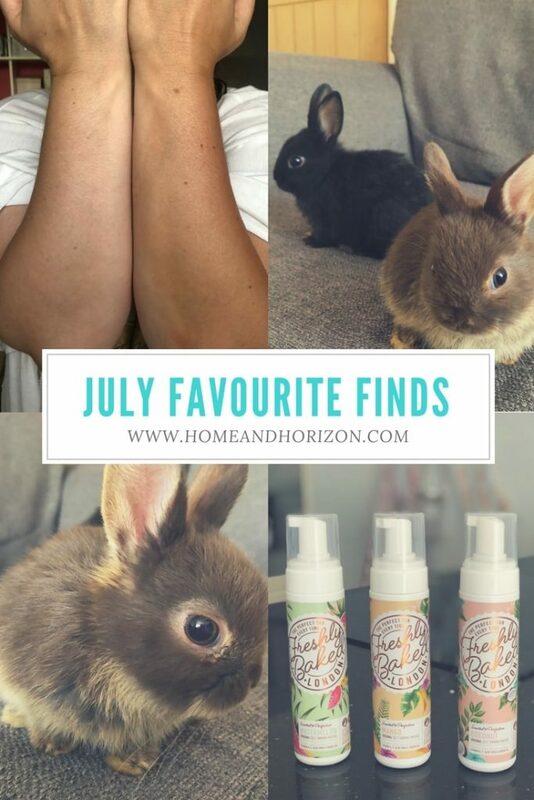 So, taking a look at sunny July, here are my Favourite Finds! My number one surprise this month was my birthday present. My special day falls on 4th July and I’ve always wondered what it would be like to celebrate my birthday in the States – I could pretend that all those fireworks to mark American Independence Day are for me! But as I get older, my birthdays don’t seem as important (or exciting) as they once did, and I really didn’t expect any surprises this year. I’ve got my iPhone and my MacBook and I really couldn’t want for anything else. But it turns out that VIP has been paying attention. Every week when we took the kids to their after school sports clubs, I’d pop into the local pet shop just to pine after the baby bunnies. They were so cute and adorable and I'd delight at seeing them every week. 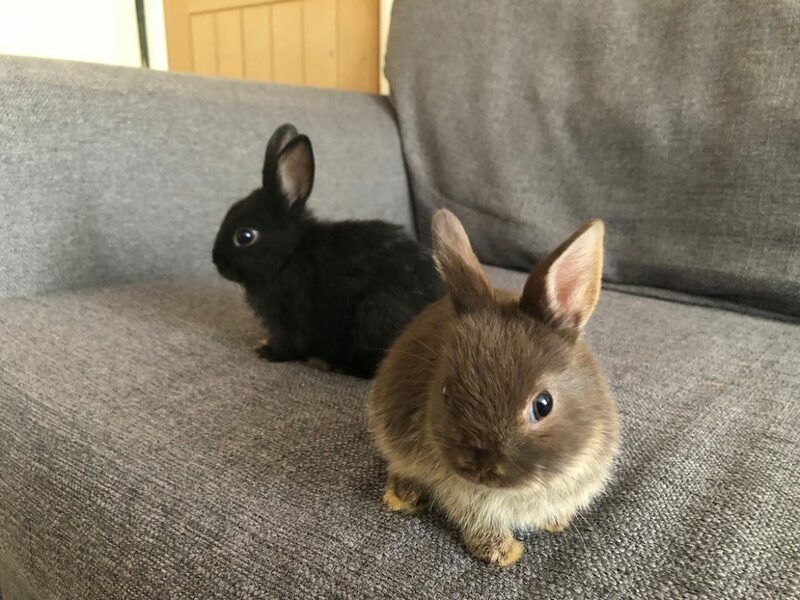 I wasn’t planning on buying any though; we already have two older bunnies (Jessie and Bo), who we got from a rescue centre as adults, so it wasn’t that I didn’t have pets, but I just thought the baby bunnies were super cute. And lo and behold, VIP went and bought two Netherland Dwarf bunnies for my birthday. I couldn’t believe it – they are gorgeous. I’ve got a black one (a boy) who I’ve named Pippin and a baby girl rabbit who I’ve called Pudding. Pudding is so small that you can actually hold her in the palm of one hand. In fact, she looks a bit like a mouse with big ears! Now all I’ve got to do is try to get Jessie and Bo to accept them, which is easier said than done. If you have any tips, please let me know! I recently came across something called Kids Pass, which I initially wrote off as something for little kids rather than for tweens and teens. How wrong I was – and silly me for assuming so. 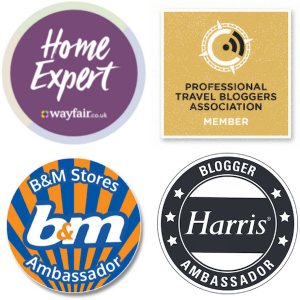 So the deal is that members receive access to a range of great benefits. Membership costs £39.99 for the year – but you can always try it out for £1 for 30 days to see how you like it. • Up to 40% off at over 500 nationwide cinemas for both adults and children 7 days a week! • Kids Eat Free or better at thousands of family friendly restaurant chains including Giraffe, Bella Italia, Prezzo, Barburrito, Sizzling Pubs and many more! 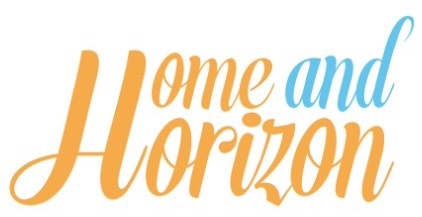 • Up to 50% off UK and European family breaks! I’m trialling the pass right now. If I'm honest, it was the 40% off cinema tickets that convinced me. They cost an arm and a leg normally, so to get them for nearly half price is definitely worth the investment- especially with the summer holidays here! 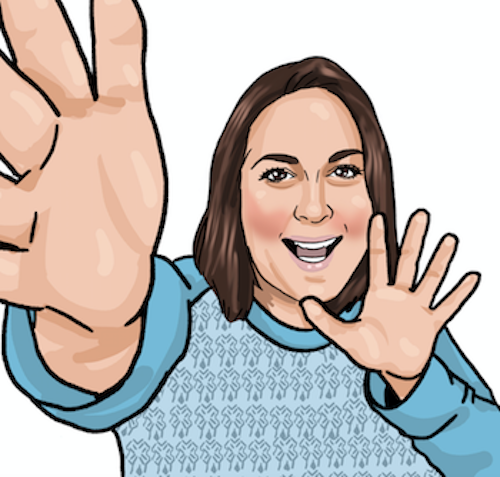 Apparently, the pass saves the average parent around £1,000 a year – you can’t argue with that! I love Romesh Ranganathan! I actually saw him at Victoria Train Station in London once and managed to get a selfie with him. I couldn’t understand why so many people were just walking straight past him and hadn’t spotted his big beard! Anyway, I was thrilled to discover that Romesh has made a new BBC TV series called The Misadventures of Romesh Ranganathan – and he’s as funny as ever. It’s about him travelling to different destinations – countries that we typically wouldn’t deem safe or appealing for a holiday (such as Haiti and Ethiopia) – to explore what it’s really like there. And on his travels, Romesh just comes out with the funniest of comments. I could watch all the episodes back-to-back and never get bored. One thing’s for sure – they’re always guaranteed to put me in a great mood. Superdrug sent me some Freshly Baked London tanning mousse to try. I’d heard of ‘Freshly Baked’ but I’d never tried it before, so I was intrigued to see how it turned out. I’m actually a fan of the ‘tan in a can’ rather than the sunbeds; there’s something to be said for being able to look healthier (and slimmer) when you use self-tan. Apart from buying a trusted brand, the key to getting a great tan is all in the preparation: exfoliate and moisturise! 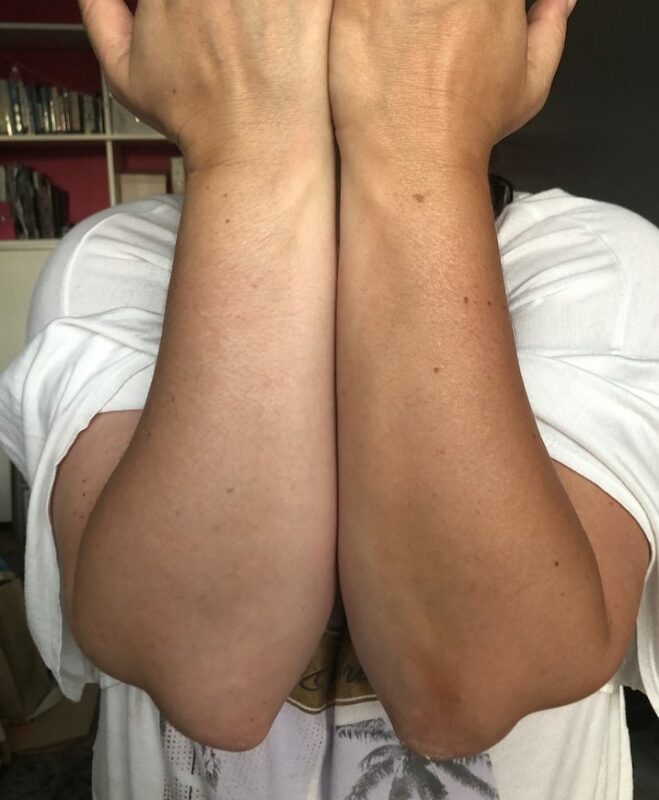 I’ve also found that using a tanning mitt (available from most health & beauty stores including Superdrug) will leave you with better results. Self Baked was really easy to apply and I was able to control how much mousse came out. I really liked the feeling of the light mousse on my skin; it didn’t make me feel sticky like some tanning creams can make you feel. I did the usual exfoliate and moisturise, then I applied the mousse with the mitt (to one of my arms) and left it. I noticed that instead of getting an instant tan, it develops over time, which I really like. So as you can see from the picture below, it offers a nice even coverage and doesn't look fake at all. Before (left) and a nicely tanned right arm! 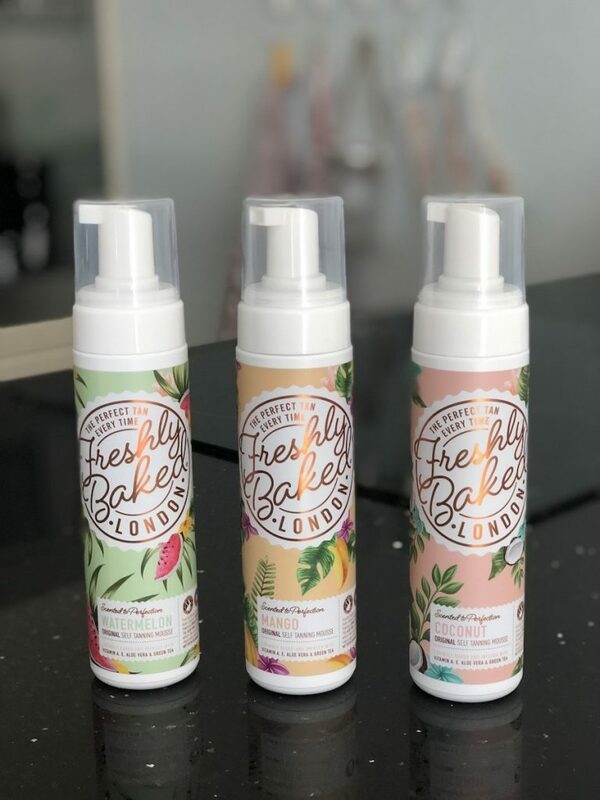 The best bit for me about Freshly Baked was the scents – I tried Watermelon, Mango and Coconut and all three of them smelt gorgeous – no more obvious fake tan smell! My favourite was probably Coconut; it reminded me of being on holiday! Freshly Baked is available to buy in Superdrug for £13.99, which is a decent price given that the product lasts ages, is effective and smells divine. Plus if you buy one now, you can get a second for half price on selected Freshly Baked products. 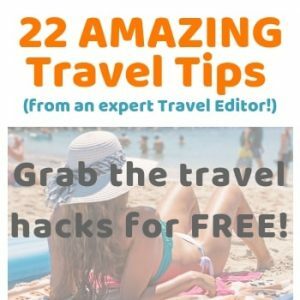 As I read for a living (I’m a travel journalist), I don’t tend to read for pleasure as I need to give my eyes a break. But I miss reading to relax and that feeling of getting lost in a book, so what I tend to do is buy books that I can dip in and dip out of. I recently bought a book called Where’s My F**king Unicorn? by Michelle Gordon. It’s a bit of a self-help book and, in refreshingly down-to-earth language, the author writes about how to harness all the self-knowledge I’ve gained (in my 43 years on this planet) and start putting it to practical use. I’ve started to read it and I’m finding it quite tricky to put down, which for me means I’m really enjoying it. I’m always been a big fan of self-help books – ever since my dad gave me ‘Chicken Soup For The Soul’ books to read in my teens. VIP thinks books like this are ‘mumbo jumbo’, but that’s just his opinion; I derive great pleasure from reading them. They inspire me, provide hope and make me feel like I can overcome any niggles of self-doubt. And as long as they have a positive effect on me, I’ll continue to read them. Ha ha – she does doesn’t she Jo?! It’s amazing how quickly they grow though. Watermelon tan sounds amazing. I’ll check those out next time I’m in Superdrug. It smells pretty awesome as you’d imagine! I hope you have a lovely time in Germany, I am visiting Cologne next month and loved Hamburg too. 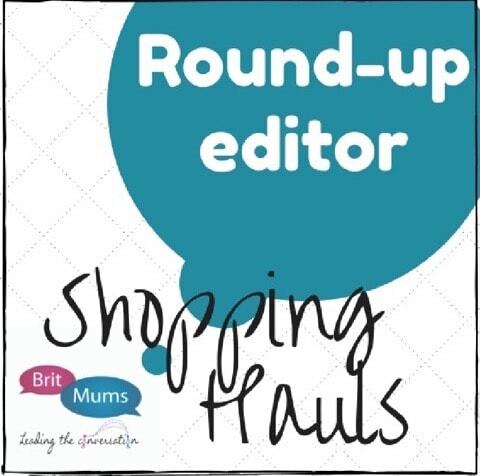 Totally enjoyed reading your July favourite finds post. Good luck with Germany, I know you all will enjoy your holiday there. Try to taste their Black Forest Cake with is a local favourite there. Yes, I actually made Black Forest Gateau once – it’s so involved but very moorish! How cute, I miss my bunnies – I had 12 at one time. I lost my last one earlier this year in March. I know what you mean in regards to birthday’s and it’s so cute that you got this surprise! Always nice to be surprised on your birthday isn’t it? Yes, I know what you mean Rebecca – it’s nice to be able to find a tanning solution that doesn’t turn you orange! I had a really great trip to Hamburg last year as well. I would love to explore more of Germany! It’s a beautiful country and I don’t think many people are aware of how picturesque it is. I was delighted! Still am. They are so lovely to hold. Never thought I’d be such a huge fan of bunnies but there you go! 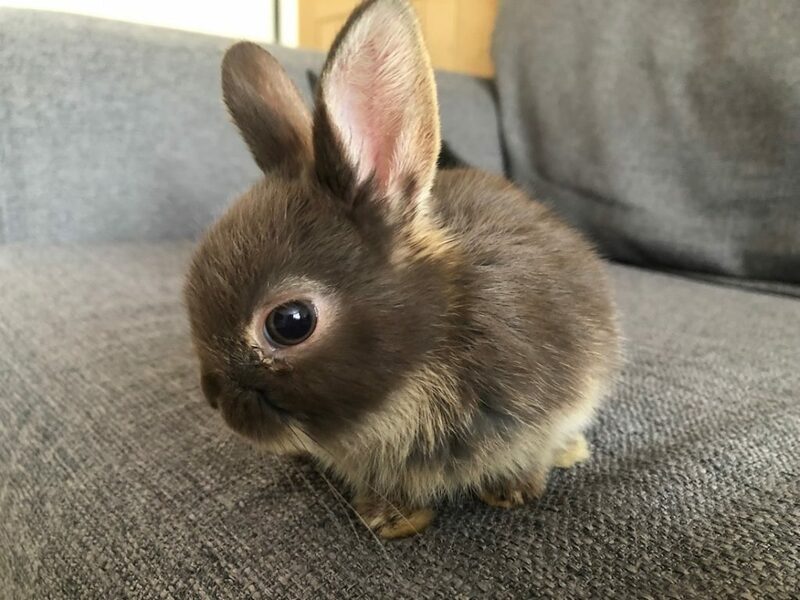 Baby dwarf bunnies are my favorite, just looking at the picture of them cheered me up today. Ah thanks Elaine – that’s nice to know. I’ve been loving playing with them so I haven’t been really productive at all lately!